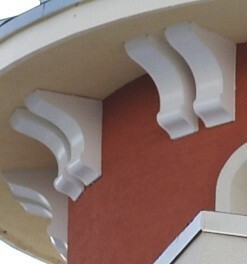 Soffit Corbels, Dentil Blocks, and Cornice Brackets in various shapes and sizes for Residential and Commercial appeal. Designed hollow for a lightweight installation, yet product remains strong and durable. Exposed areas are covered for aesthetic appeal. All curves have a seamless, smooth design.